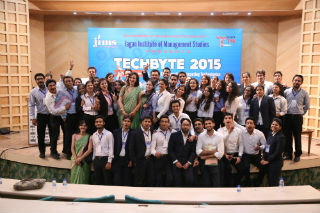 Jagan Institute of Management Studies, Rohini campus organized its Annual IT Symposium, TechBYTE 2015 on 17th October, 2015 at PHD Chambers of Commerce, Khel Gaon, Delhi. Faculties from other GGSIP university affiliated colleges attended this symposium along with JIMS IT faculties and MCA students.The Department of Information Technology organized this event with entire zeal and zest and made it a grand success. Renowned personalities from IT industry graced the event with their presence. 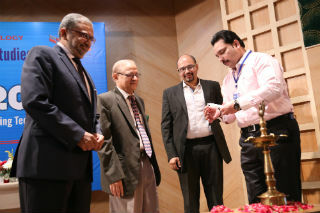 The Chief Guest and Guest of Honor of the day were Mr. Rahul Chitale, CTO, Askme.com, and Mr. Rajeev Agarwala, Co-founder, Baysil respectively.The Keynote Speaker for Inaugural session was Dr. V.B. Aggarwal, Dean, InfoTech–JIMS, Rohini Sector-5). Ms. Mahima Gupta and Ms. Ankita Chopra didIce-breaking ceremony and introduced JIMS and IT department to the audience. Thesymposium began with lighting of Lamp and remembering the goddess of knowledge,Maa Saraswati through Saraswati Vandana in the presence of Dr. Parveen Arora, Dr. Barjesh Kochar, and venerated guests. 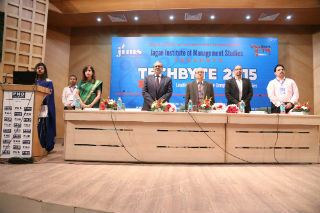 Dr. Barjesh Kochar welcomed the Chief Guest and Guest of Honor on behalf of JIMS fraternity. Prof. (Dr.) V.B. Aggarwal as Keynote speaker motivated the faculty and students with his enlightening speech. Dr. V.B. Aggarwal,began his speech by focusing on the achievement of JIMS and then moved to the happenings which are going on in the IT sector. He stressed on the fact that IT industry is now applying & utilizing concepts of Data Science and Big Data Analytics. He further asserted the fact that today cyber security is the foremost requirement for all end-user corporates. His address was well applauded by the audience. Then respectable Chief Guest, Mr. Rahul Chitale, Chief Technological Officer (CTO), Askme.com began his speech by setting the atmosphere into a frenzy mode and stressed on the need for developing a unique identity in the world today. He urged the students that there is no place for mediocrity in the business world and that the students must develop capability to stay competitive. He further highlighted the need for an effective utilization of data and that in the IT industry normal Distribution is followed. He motivated students with his words of wisdom, by stressing on the need for developing expertise at the back end as there is lot of opportunity for data crunching and the like. Subsequently, Guest of honor, Mr. Rajeev Agarwala, Co-founder, Baysil started his speech in a very interactive manner and discussed about required skills of an Entrepreneur. He stressed that we need to leverage areas of our skill. A couple of dimensions have to be worked beyond certifications of University and a student is responsible for his or her career. He motivated students to be like a bloating paper to grasp knowledge. He said: "Work for a role. not for a job or profile" and he shared a thought: “Do big things that others don’t”. The inaugural session was concluded by release of INSIGHT 2015 and presenting mementos to the guests followed by vote of thanks by Dr. Parveen Arora, HOD(IPU). The First Technical Session was initiated by Mr. Manish Aneja, Senior Software Engineer Lead, IBM. He discussed about Portal Management & JSF Application in web development. He presented implementation of Portal by IBM named Bluemix. He discussed about what, why and how aspects of #Bluemix. He summarized some opensource tools by IBM. He discussed about some problems that are resolved by Bluemix. He told how Bluemix is built on cloud foundry that is a open source tool.He also showed a brief demo of IBM's Bluemix to manage the Client demands. The session was then taken over by Mr Love Chopra, cofounder, careerguide.com and he discussed “Technology trends and career” with students. Various career opportunities like application development, QA, business analytics, growth hackers, mobile application development and embedded programming were highlighted He emphasized on Learn how to code, attend hackathons, build good projects, internship from 1st year, create LinkedIn profile and follow technology blogs. Next speaker for the session was Mr. Vivek, training and development manager IBNC who discussed “what works better data or technology?”He started his session with introduction of cloud, its services and categories.He also discussed about cloud security & big data. During his session he explained map reduce in detail with mapper and reducer function. After explanation he answered questions on cloud, big data and security protocols. Last speaker for session was Mr. Neelmani Gautam, Birlasoft whose topic was CRM-Cloud-Big Data. He elaborated CRM, cloud computing, bigdata and how they are related. The discussion that took place was very valuable for the students to understand basics of all these three. The Second Technical Session was commenced by Mr. RakeshVij, chief business officer, Aricent. He nourished the audience about technologies of future. He shared his views and knowledge on latest in communication technology and journey from GSM and through EDGE, UMTS and towards 4G and LTE. He also discussed on IOT and its business impact on wearable and automobile industry. Use of IOT devices in education, traffic management, smart meters and healthcare. 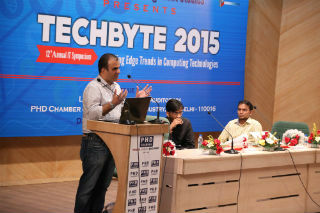 Next technical speakers were Mr. Vaibhav Gupta, Adobe and Mr. Sandeep,Dell. They jointly conducted their session and spoke on the topic named open web app, Security. They also gave live demo of the sql injection pentration. They emphsized on need of securing web apps. It was yet another wonderful session and equally useful for students.The second technical session was concluded by Ms. Suman Madan presenting Vote of Thanks to all speakers from IT industry.